Life’s a circus for Caernarfon care home residents and owner Mario | News by Wales Express News, People Before Profit! The circus came to town for residents of a dementia centre in Caernarfon – and it brought back fond memories for the owner whose dad was a lion trainer. Performers from a locally-based circus company went along to Bryn Seiont Newydd in the town’s Pant Road to demonstrate traditional skills like juggling and plate spinning. A number of the residents who gathered to watch the spell-binding show later took up the invitation to try some of the routines themselves. Mario Kreft joins in with, from left, Nia Davies Williams, Alex Haycock, resident Jean Sawyers. Karen Wilson, Mario Kreft, Debra Barlow, Charlotte Foad and Iago Jones. And even the home’s proprietor, Mario Kreft MBE, called on his family background in circus to try his hand at deftly spinning plates on top of a stick. The big top treat came courtesy of Syrcas Cimera, a company based in Rhosgadfan whose mission is to bring contemporary live circus, theatre and the arts to a wider audience. From July 18-27 they will be amongst the stars of Syrcas Feast, an all-action week of circus-themed performances and workshops at Pontio, Bangor University’s Arts and Innovation Centre. Two members of the Cimera team went along to Bryn Seiont, owned by Mario and Gill Kreft of the arts-loving Pendine Park care organisation to provide specialist care for 71 dementia sufferers. 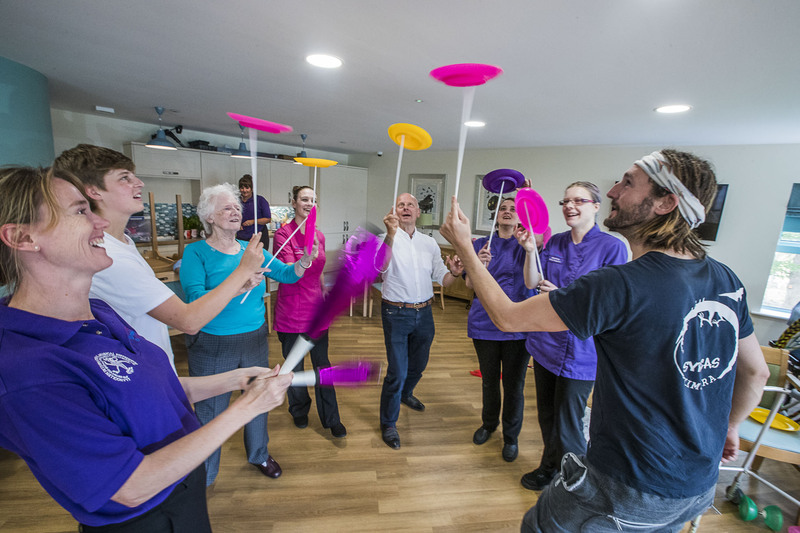 Mario was especially keen to host the visit as part of the residents’ enrichment programme at the centre of excellence because of his strong family links to the circus world. His late father Franz Kreft was a renowned lion and bear trainer and he was Christened by the Bishop of Durban in the Big Top when the circus was in South Africa where he was born. At Bryn Seiont Newydd performers Iago Jones, 32, and 19-year-old Alex Haycock put on a dazzling show, making juggling clubs fly through the air, keeping the multi-coloured plates spinning and demonstrating their prowess at hoola-hooping. When it was the turn of the residents to give the routines a try, one of the first to volunteer was 81-year-old Jean Sawyer who used to live in Talysarn before moving into Bryn Seiont Newydd. With just a little tuition from Iago she quickly mastered the tricky art of plate spinning, keeping one turning for many minutes. Circus skills at Bryn Seiont, Caernarfon. A delighted Jean said: “It’s the first time I’ve ever tried anything like that but I found I could do it and it was a lot of fun. Another resident who rapidly mastered the mysteries of the spinning plates was 94-year-old Marguerite Walker who used to live in Brynrefail on Anglesey. “When I was a little girl the circus used to come to town and perform in Caernarfon and we’d all go to see it. Watching the show today has brought back some lovely memories of those days,” she said. Mared Huws, the arts development co-ordinator at Pontio, said Iago and Alex would next be showing off their stilt walking abilities in the big parade through the centre of Bangor which will kick off the Syrcas Feast on July 20. Before that they’ve been helping out at circus-themed art workshops which Pontio has arranged for children at a number of Bangor schools, making objects such as a big yellow submarine and Owain Glyndwr flag to carry on the procession. “When we invited Mario to get involved with Syrcas Feast he was very keen to have the Cimera performers visit Bryn Seiont Newydd and do a circus workshop because of his own links to the circus world,” Mared said. “It’s part of Cimera’s general outreach programme and the residents clearly enjoyed watching and taking part in some of the routines. 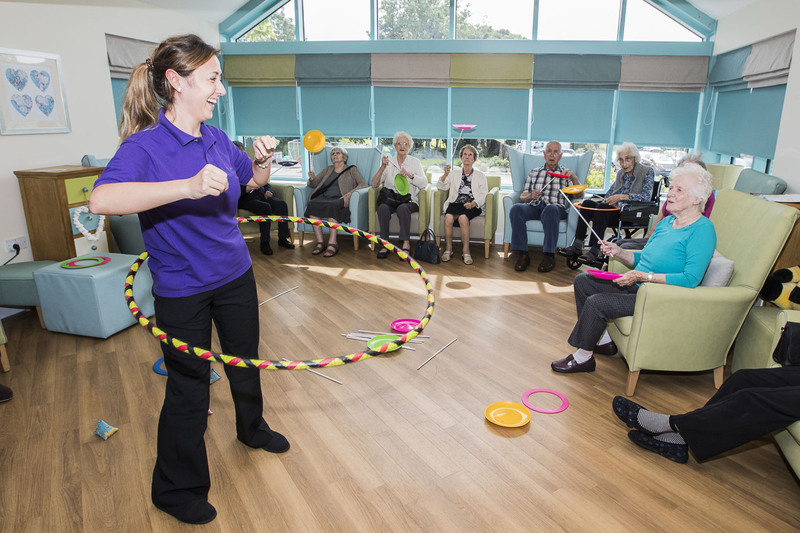 Nia Davies-Williams, Bryn Seiont’s musician in residence who helped arrange the visit, said: “It’s lovely to see the way the residents have enjoyed the performance and marvellous watching them trying the routines for themselves. Performer Iago was happy with the way the session went. He said: “While it was quite challenging it’s also been a very rewarding experience for Alex and I. After putting in an impressive plate spinning performance alongside Iago, Mario Kreft said: “I think a few people know that my father was a lion trainer and both my parents worked in the circus for many years, and it’s funny how the performing arts side of things translates into what we do at Pendine and Bryn Seiont Newydd. “We’ve very much focused on arts enrichment in the 30 years we’ve been going and I think circus is a wonderful form of the arts because it excites people.